yet to be claimed and you are getting the final NOTIFICATION as regards this. Million Pounds Sterlings) in cash credited to file KTU/9023118308/03. Sterlings) will be released to you by any of our payment offices in Europe. fill the information below to enable you file your winnings sum. Please indicate "X" for the option you want your prize remitted to you. Listed below is our payment modalities and option of payment. driver�s license or international passport should be attached to your email. This should be carried out within the next 48 hours up on receipt of this email Notification. This Email with the Subject "WINNING NOTIFICATION" was received in one of Scamdex's honeypot email accounts on Fri, 16 Feb 2007 19:58:14 -0800 and has been classified as a Generic Scam Email. 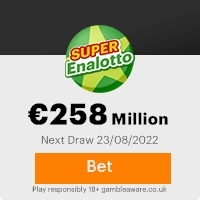 The sender shows as Euro Millions Online Lottery <uklottery.office1@laposte.net>, although that address was probably spoofed. We recommend that you do not attempt to contact any persons or organizations referenced in this email, as you may expose yourself to scammers and, at the very least, you will be added to their email address lists for spam purposes.